The biggest benefits of working for Evolution MotorSports are the weekends. “Everybody’s working for the weekend,” was the mantra that Lover Boy engrained into our heads back in the early 80’s. This mindset, like everything in life, means different things to different people. Here at EVOMS the weekends bring circuit track time, mile long solo drag runs and most recently ½ mile roll-on side-by-side drag racing! 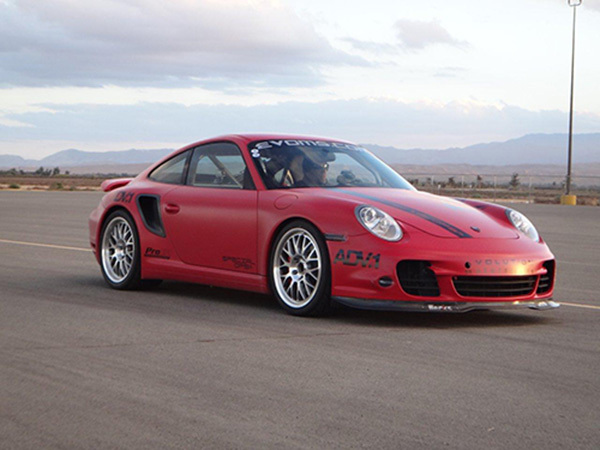 On the list of cool things to do with some of the world’s fastest Porsches, those three rank very, very high. Last weekend was no exception. We have joined the boys over at Shift S3ctor for a few track events, but this was the first Airstrip Attack that we participated in. The Airstrip Attack is one of our beloved roll-on side-by-side ½ mile drag race events. In normal EVOMS fashion we cannot show up with squirt guns and silly string, this event called for participation from our super-secret EVOMS Special Ops division. After the results from this weekend, the secret is out. This two day event started with a Tuner Shootout. The grid was littered with Nissan GTRs, Ford GTs, along with other foreign and domestic muscle. 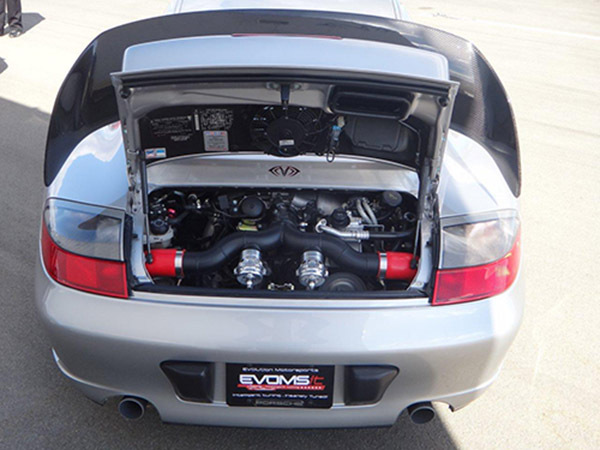 Our entry into the Tuner Shootout was our beloved and royally abused 997TT appropriately dubbed “Mayhem.” She started life as a bone-stock 997TT and was the test bed for every single 997TT product and package we offer. As with any narcotic, this slippery slope lead her to the life she lives today. Powered by an EVOMS Special Ops 4.0 liter engine, a couple of little turbochargers, a whole bunch of fuel to give it forward progress and with all of this we claim 1,500 horsepower… but as for the real number? A gentleman never asks and a lady never tells. Day one ended with a beautiful sunset off of the runway and a first place trophy to add to Mayhem’s collection when we ran away from a 1,000+ horsepower GTR running on E85. We will not rub it in, but even running Mayhem with all four tires putting power to the ground we had significant traction issues on the far from prepped tarmac. Because of this we brought the boost down to 2 bar. To put this in perspective we normally run the car at 2.62 bar but we have the fuel and motor to run 3.1 bar when the competition gets close. Now on to day two. A chilly morning meant cold track temps and further traction issues. We were joined by one of our Special Ops members simply known as Stacey. Some of you may remember him, probably the hard way, from the most recent Texas Invitational as the 6-Speed champion. 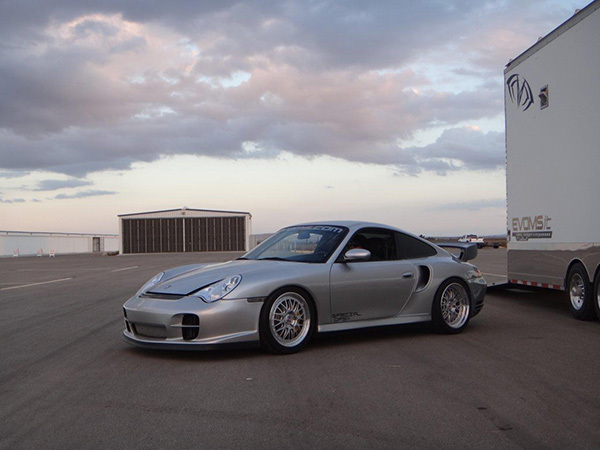 His 996 GT2 is all business, but has the cleanliness and presentation of a show car. 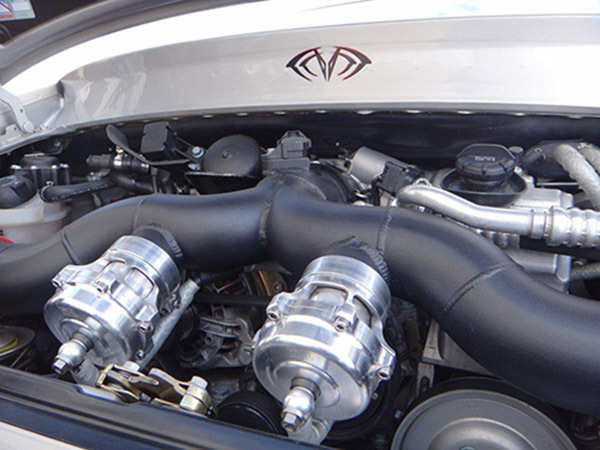 It is powered by a 3.8 liter EVOMS Special Ops engine, a couple little turbochargers and enough fuel to make NASA proud. A few warm-up passes got Stacey’s GT2 and Mayhem ready to do battle in the Euro class on Sunday. After a few serious battles, our worst nightmare happened… Stacy’s GT2 and Mayhem were to run to heads up for the title of fastest Euro car at the Airstrip Attack. This is exciting and horrifying at the same time. This means we solidified first and second place, but do we give the nod to one of our best customers or do we see what the cars can really do? After a telepathic conversation from underneath helmet visors the latter was decided. Now the speculation begins… Stacey has less power but weighs 800lbs less. Mayhem is all wheel drive where Stacey just has the rear two putting power to the ground. Who will get the jump? Who will get the traction? Because these are proper cars without video game gearboxes, will someone miss a shift? Both drivers nailed the start, both cars hooked up and Stacey took an early lead with his weight advantage. Both drivers were spot-on with their shifts and slowly Mayhem started to reel in Stacey. These cars yearn for 4th, 5th and 6th gears and with the layout of this race; this is where they get to live. The finish cone was passed and no one knew who won, not even the drivers. Like EVERY Hollywood racing flick it came down to the cliché photo finish. Mayhem took it by a bumper. All in all it was an exceptional weekend. EVOMS cars won every class we entered and we came home with a few shiny new trophies. 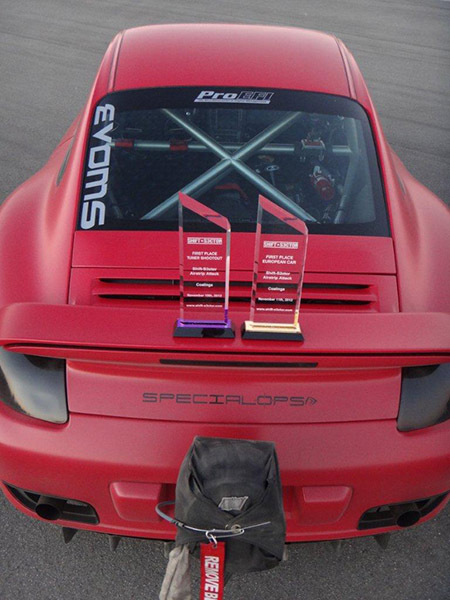 Big thanks to the EVOMS Special Ops division and Stacey for representing the worldwide Evolution MotorSports family. Thank you to the boys at Shift S3ctor for putting on a great West Coast event. Finally a huge thanks to our supporting vendors for making these two cars what they have become. They are: ADV.1 Wheels, Toyo Tires, ProEFI, Injector Dynamics, T1 Race Development and many, many others! Also, all of the EVOMS employees, customers, vendors, partners and affiliates worldwide. Because of you all we get to enjoy many fantastic weekends.